After reading "Past Midnight", I was dying to read this novella. 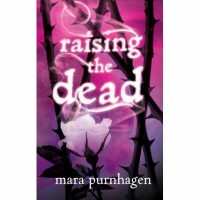 Given that "Raising the Dead" is only a novella, I feel as though it was rather good. It served its purpose in making me want to read the next book, "One Hundred Candles". Coming off of "Past Midnight", this novella begins with Charlotte at a book signing with her father. It's now several weeks from where the first book left off and Charlotte is still debating on whether what happened in Charleston was real or not. For the most part, things have returned to normal, but that changes when a major rain storm causes flooding and sends coffins floating through the streets. Charlotte and her family work to bring the caskets back to their burial location, where they met William. As to avoid spoilers, I'll just state that while the novella isn't as interesting as the first book, it is an intriguing novella. Charlotte is starting to wonder if Noah feels the same way about her as she does him. Now, romance didn't play a huge part in the first book. Charlotte had a crush on Noah, but it wasn't the core. As the series goes on, however, it looks as though Charlotte is going to be struggling with her feelings towards Noah. I'm curious as to where it'll go. All in all, if you're looking to read the "Past Midnight" series - don't skip this novella!